A Chinese proverb says: �It takes ten years to grow trees but a hundred years to cultivate human beings�. In the case of Bangkal trees, this saying is absolutely true. On the World Forestry Conference held in 1972, the Bangkal tree was praised as a miraculous tree because it grows very quickly compared with other trees. 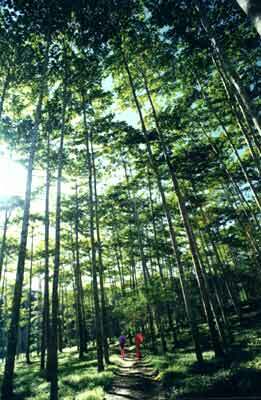 The annual growth of Bangkal trees of less than ten years can reach 2-3 meters, and the diameter can grow 4.5 -- 5.5 centimeters. Each year, the growth volume of a hectare of Bangkal can reach 80-90 cubic meters. It is praised as �a miraculous tree� and �a tree of a precious stone�; therefore, it is an ideal tree for artificial plantation. Bangkal trees have good-looking appearances. The trunks are elegant and upright; the canopy is round; the leaves are large and bright; and the branches and twigs also have peculiar shapes. Each layer of the tree points to the sky from four directions, and big trees often have more than 10 layers of branches and twigs. The branches of adult trees can be as tall as 8 to 17 meters. Bangkal trees not only grow very fast, but also have excellent quality. The wood is easy for sawing, planning, and cutting; besides, the wood becomes dry very quickly and seldom distorts. Bangkal wood is suitable for making sideboards, matches, tea boxes and other packing boxes. It can also be used to make doors, windows, rafts, ceilings, and indoor decorations in construction. The fiber length of the wood is 1.49 mm; therefore, it is also ideal raw material for making manmade fiber, fiberboard, and plywood and paper pulps. Bangkal tree belongs to arbors trees and is a kind of sub-tropical trees. Its growth requires sufficient sunlight, and cannot resist shade at all. In China, Bangkal wood trees mainly scatter in Guangdong, Guangxi, and Yunnan, etc. ; and we can also find them in India, Burma, Vietnam, Malaysia, Nepal, Philippines, SriLanka and Indonesia, etc.